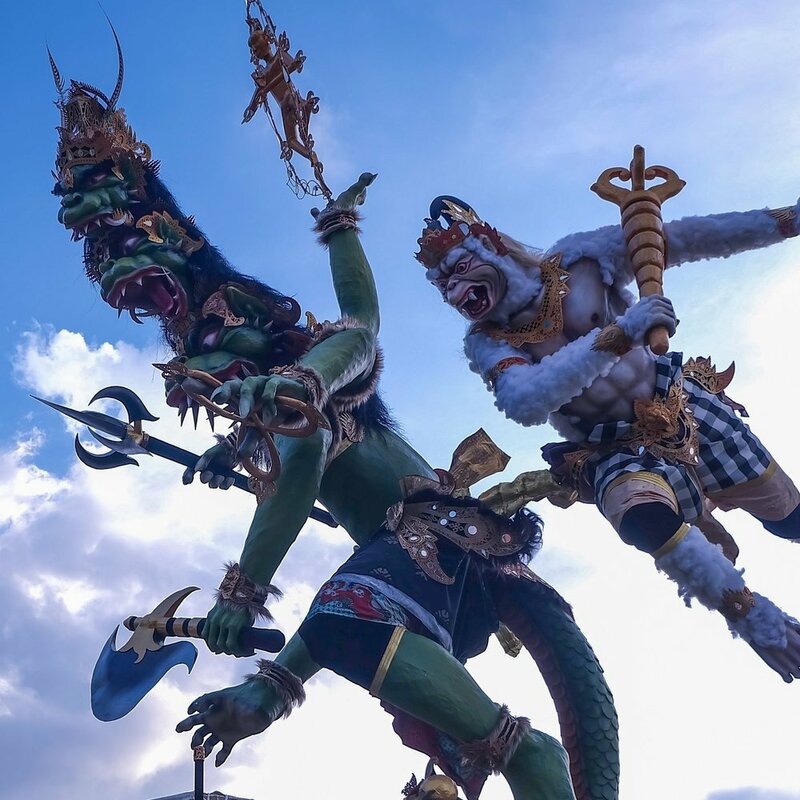 The Mesabatan Api ritual is held annually on the eve of Nyepi, the Hindu Day of Silence which this year falls on March 6th, and only takes place in Pakraman Nagi village in Gianyar Regency, around 30 km from Denpasar. 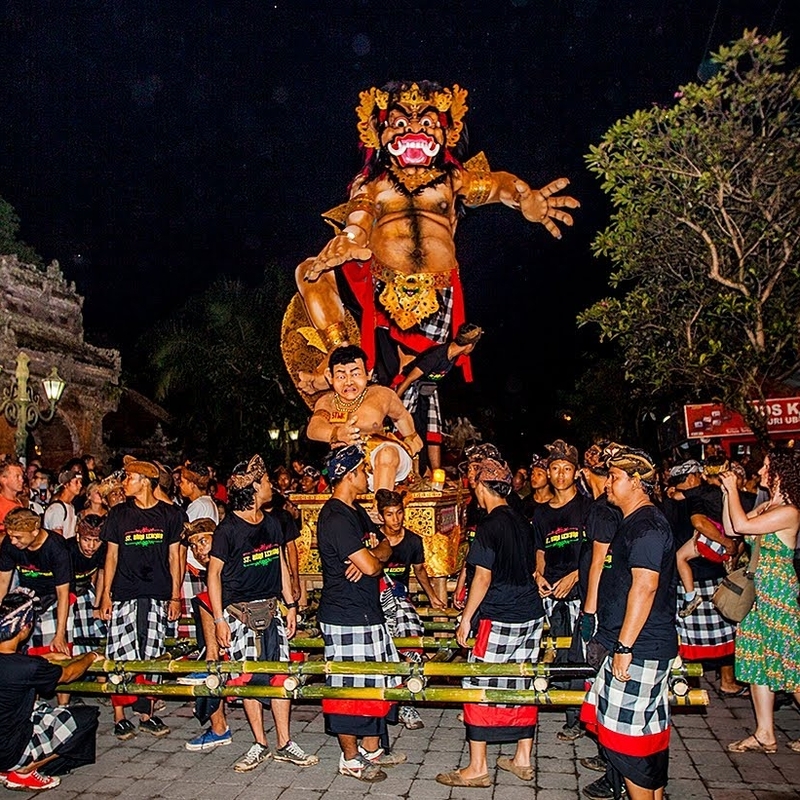 A similar ritual, called Ter-Teran, also takes place on the same day in Jasri village in Karangasem, East Bali. In Pakraman Nagi village, the fire battle lasted for about one and half hours, divided into sessions so the participants could rest. Prior to the ritual, both young and old men had cooked the traditional Balinese dish of lawar, a mix of chopped meat (mostly pork), vegetables, spices and grated coconut, so they could eat together. While these two villages hold special fire battles in the evening, Balinese Hindus across the island hold the Tawur Kesanga cleansing ritual on every main crossroads which takes place during the day to bless the roads and so they are clean from negative forces. In the following afternoon, Balinese will hold the Pengrupukan ritual where people carry burning torches and make loud noises around the house, so that the Buta Khala (evil spirits) do not disturb the human world or the universe. Towards sunset, the Ogoh-Ogoh (Giant Monsters) Parade takes place in every banjar (hamlet) in which the youths of each hamlet enthusiastically carry giant effigies representing the Buta Khala around the local vicinity and later burn them to symbolize the final elimination of negative forces. What is certain is that by the time the Balinese Hindus observe the Çaka New Year on Nyepi, all the negative forces have been vanquished.